Developed during years of experience in the fields of construction, mining, sewage and civil works. The Powley range of automatic vacuum-primed centrifugal pumps are known for their on-site reliability, ease of operation and maintenance. The GP 150M utilizes the one piece Powley Vacuum Pressure Seal. 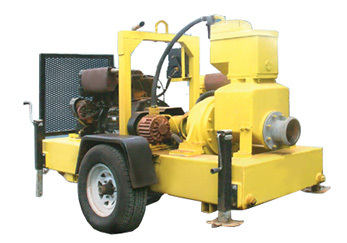 The oil lubricated vacuum pump is used for dry priming the pumps for suction lifts up to 30 feet and where high airflow is expected. The oil lubricating reservoir separation tank (Coalescer Tank) is manufactured from Alloy, with a large oil capacity of 5.5 gallons and a condenser area of over 2 square feet, these features allow near-perfect condensing of the oil contained in the air mixture, optimizing the oil lubrication of our environmentally friendly vacuum priming systems. This tank cools the circulated oil, cooling the vacuum pump on highvacuum applications without seizing the rotor or bearings. This tank houses the float system, which controls the level of liquid in the main pump volute casing and priming sump. The Powley system is developed so that 25cfm to 80cfm vacuum pumps can be used with the same float gear and Priming Tank, hence components common for various capacity systems. This feature is important for easy servicing and stocking of parts. There is an external vacuum S-Steel air filter, where maintenance and cleaning can take place without the removal of associated parts. It can be serviced without a wrench, simultaneously when the oils are being checked. This sump fits under the Priming Gear Tank, its purpose is to separate the air from the water on various applications including wellpoint dewatering and sewage overpumping. The Powley priming sump has a capacity of over 25 gallons, making the separation highly efficient. Due to the large surface area of the sump, the velocity of the water and air entering the pump chamber is slowed down considerably, which decreases turbulence, enabling the float gear to last longer before service is required. The GP 150M’s non-return valve is a solid non-clog ball and seal, designed for easy maintenance, and the passing of large solids. For More Information, Click Image Below To Download a PDF Spec Sheet.